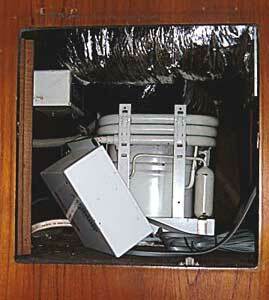 The main culprit of noise in this room is this compressor which is located in the top of the closet. This will be removed freeing up closet space and making the room quieter. The new compressor will be located in the engine room and only the air handler will be in the stateroom. That will be mounted under the bunk and have isolators for sound reduction. This location will allow venting into the valance area.